Citrus medica var. sarcodactylis, or the fingered citron, is an unusually shaped citron variety. The fruit is segmented into finger-like sections, like those seen on pictures and statues of Buddha. 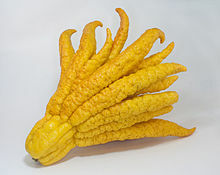 It is called Buddha's hand in Nepali(Buddha ko haat). Chinese (佛手柑), Japanese (仏手柑), Korean (불수감) and Vietnamese (Phật thủ). The different types of this citron variety have shapes from "open-hand" types with outward-splayed segments to "closed-hand" types, in which the fingers are kept together. There are also half-fingered fruits, in which the basal side is united and the apical side fingered. The origin of this kind of citron can be traced back to Nepal or China, where most domesticated citrus fruits originate. It has a sweet, lemon blossom aroma and no juice or pulp. The mild-tasting pith is not bitter, so the fruit can be zested or used whole. This page was last changed on 22 May 2018, at 18:48.